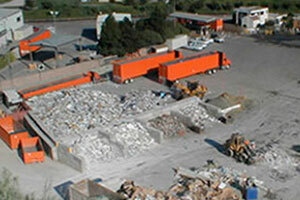 Recycling Drop-Off and Buyback Center. Accepts metal cans (aluminum, steel, tin), clean aluminum foil, aluminum scrap, brass and bronze, cardboard, cast iron, color and white paper, copper, junk mail, glass containers, magazines, newspapers, paperboard, paperback books, hard plastics nos. 1 through 7, steel, tin, and wooden pallets. Facility also accepts used motor oil and oil filters, antifreeze, batteries, latex and oil-based paint (up to 15 gallons per day), stains and finishes, compact fluorescent bulbs, fluorescent lights, and various types of electronic equipment, such as desktop and laptop computers and peripherals, computer monitors, televisions, printers, copiers, scanners, fax machines, VCRs, DVD players, washers, dryers, and video game systems. Please note that monitors and TVs with a broken Cathode Ray Tube (CRT) will not be accepted and should instead be taken to the County's South Coast Recycling and Transfer Station. Also accepts disks (compact and digital video), audio and video tapes, printer cartridges, holiday lights, and small appliances such as MP3 players, cell phones, hair dryers, vacuums, and shavers for recycling. Open Monday through Saturday from 8:00 a.m. to 4:00 p.m. Serves entire South Coast communities.